We’ve all experienced it: Getting home from a long day at work, and to give our minds the break they well deserve, we passively binge on Netflix, perhaps after guiltily glancing at that book bought months ago before tuning into the latest show obsession. It’s time to pick up a book and lose the guilt. Let’s up the pleasure reading in 2016. I could not put down any of the exceptional 10 books below, which vary from middle school to advanced reading levels, digestible short stories to epic biographical landscapes. Which one will you read next? “Rules of Civility” by Amor Towles – This lovely and fun novel tracks the lives of two 20-something single women in New York City. The twist? It’s 1937. “Z: A Novel of Zelda Fitzgerald” by Therese Anne Fowler – By now, visions of “The Great Gatsby” and the period our Jazz Age authors spent in Paris have been long romanticized. This novel explores the experience of Zelda Fitzgerald, Scott’s wife, on a journey of glamour, adventure and sacrifice. “The Invention of Wings” by Sue Monk Kidd – A young white girl in pre-Civil War North Carolina is given a young slave girl for her birthday. This novel, based on true events, tracks the paths of both women as they grow up. Pretty amazingly, the protagonist was a real woman who publicly fought for emancipation. “Unbroken” by Laura Hillenbrand – Ignore the movie version. I cancelled plans on a Saturday night to finish this book, the true story of Louis Zamperini, an American runner who fought in the Pacific during WWII. His plane downs in the middle of the ocean, and he lives on a raft for a month before being picked up, very unfortunately, by the Japanese. “Sense and Sensibility” by Jane Austen – I confess I made it through a BA in English without reading a Jane Austen novel. Last semester, I read four of the six, and this one was my favorite. Who can resist sisters, love (or lack thereof) and breaking the bounds of society to find happiness? “Wonder” by R.J. Palacio – It may be an early young adult novel, but do not be fooled – this book is for everyone. August (Auggie) is born with a severe birth defect that affects the structure of his face. At the novel’s onset, he begins fifth grade in a “real” school for the first time. “We the Living” by Ayn Rand – This is Rand’s very first novel, based largely on her own personal experiences of Russia’s transition to a new communist regime. While bearing Rand’s famous philosophical stamp, “We the Living” is deeply entrenched in the action of the narrative. Usually need 30 to 50 pages to get into a book? This one gets you there by around page five. 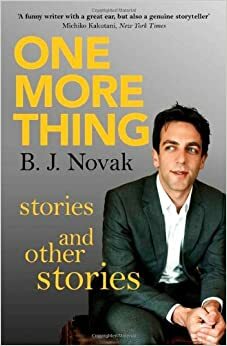 “One More Thing: Stories and Other Stories” by B.J. Novak – Sometimes funny, sometimes devastating, always thought-provoking, Novak’s short stories are perfect for the subway, waiting in line, or reading all at once. “The Nightingale” by Kristin Hannah – In WWII France, this novel focuses on the women’s war. Two very different adult sisters cope with the Nazi occupation differently, one with quiet survival and the other leaping to join the resistance. Both, we find, share an enormous amount of strength. “1984” by George Orwell – I know, you already read it in ninth grade, but the hazards of authorities watching everyone in their homes through a television screen seem far more relevant now than they did in 2003. Revisit this one, and you won’t regret it.